The gift of healthy 'crowning glory' fit for the queen this Mother's Day - Triple Joys!!! Mother's day is just around the corner. Actually, it will be tomorrow! :) And no matter how CLICHÉ it may be, we really cannot deny the fact that there’s indeed a woman behind the person that we are today. And that’s no less than our mother, our nanay, inay, ‘nay, mama, mommy or mom! How we really call them doesn't really matter. It doesn't changed the fact that she deserves more than any material things that this world has to offer given the pivotal role that she fulfils in rearing us from childhood to adulthood and possibly for the rest of our lives. Mothers just doesn't stop caring and loving! There may be opposing beliefs whether that greater maternal instinct is biologically predetermined or socially imposed, I think that everyone would agree that a mother is hardwired to love and care about the welfare of the whole family, especially her children, 24/7. For better or worse, it’s always the general well-being of her family which is on top of her priority. That is why it is no wonder that she’s an epitome of a doting human being that touches everybody’s life. So, given all her loving contributions in our life, it’s just but right to honor and return to her all the favors that she has done for us. And there is definitely no other perfect moment to do this than on Mother’s Day. You may consider a set of hankies that will bring back the memory of her wiping out her tears of happiness upon knowing that she’s conceiving a li’l creature inside her womb. That’s you, of course. A loose yet comfy clothes shall make her remember that sort of a duster or preggy dress she wore in the laborious yet exciting “nine months” of gestation. My mom definitely loves wearing a duster! It is what she prefers to wear everyday! Why not a pillow that she could hug as tight as she embraced you after giving birth. Or maybe a brassiere for protection of the very bosom she fed you with during infancy? A bed will bring to her mind your tot years when you started to crawl and roll over it freely. Shoes are a girl’s best friend, too, like your mom. Either sky-high heels or flattering flats, there’s a pair to match every bit of her fantasy. For as long as it brings comfort to her feet, it's more than enough to reciprocate the ease you had when you took your first walk with her guidance back then. If it isn't her thing, though, a flip-flop will cause her to think that she also disciplined you through the proverbial “rule of slipper” hit on your buttocks while you were growing up. Aren't these gift ideas very sweet (nostalgic too)?! These will all definitely send her down the memory lanes... Pumped that sweetness even more by personalizing each item and you are definitely sure to put a big smile on her face and a tear or two down her eyes! Tears of joy! You see, they are never really hard to please! And the possible list of gift ideas can go on, and on..... But if you are still not convinced, I have another gift suggestion that will surely make our mothers happy - the NOVUHAIR 3-in-1 pack which includes the topical scalp lotion, herbal shampoo and conditioner. Yes, you read it right. All your hair's need in just one pack! And to make it more personal and extra sweet, why don’t you the shampooing yourself?! Spray a liberal amount of NOVUHAIR topical scalp lotion onto your mom’s scalp and massage it for five to ten minutes.You may not even know that with such a plain gesture of yours, it can melt her heart as it reminds her of the past when she used to do the same thing while you were still young, either as a trick to put you easily on a slumber or merely a relief every time you got sick. Those caressing hands of yours, likewise, imbibe your act of giving back the "natural care from mothers" like her. Whatever impression it may have on her, what's tangible she could gain is that you're giving her nature's gift of health. NOVUHAIR Topical Scalp Lotion is so unique that it combines 19 natural herbs, essential oils and co-factor nutrients- all working synergistically to help address hair problems from growth to vanishing. This breakthrough product helps to rejuvenate, nourish and maintain the moist of her tress from root to tip, aids in stimulating the growth of her hair and helps prevent it from excessive falling, while improving the overall appearance. 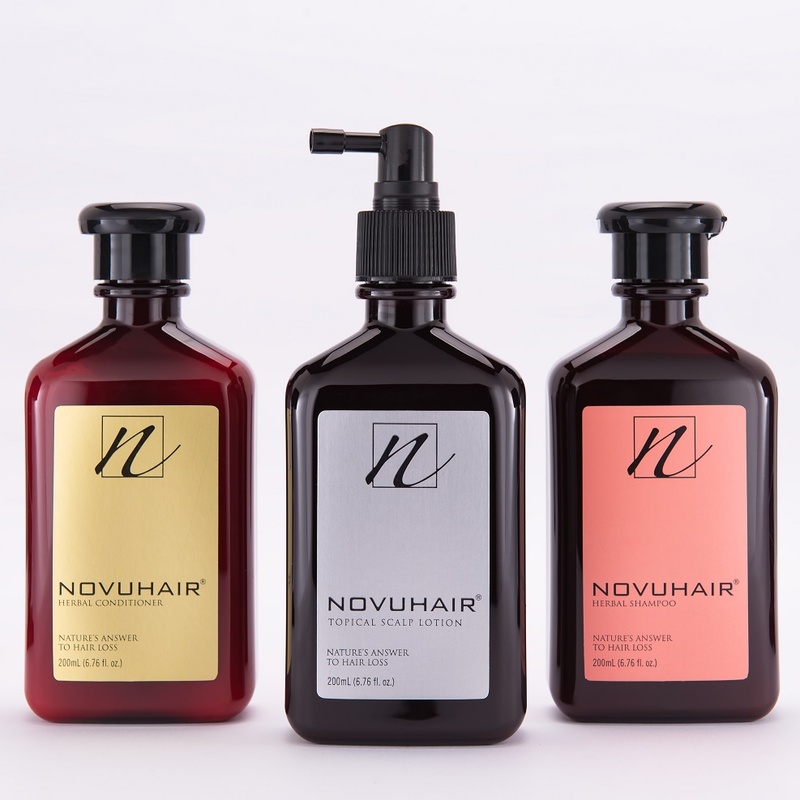 NOVUHAIR 3-in-1 pack is truly beyond compare. Head on to any Mercury Drug and other leading drug stores to get a dose of nature's answer to hair loss. For inquiries, call 413-6570 or 0922-8830575, and visit www. novuhair.com for more promo announcements and exciting updates.